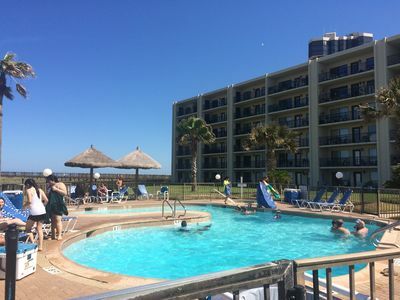 Relax in our Spacious 3rd Floor Beach Front Condo with a magnificent view of the Gulf & with 3 large Pools, one children's Pool, 3 hot tubs, 4 Tennis courts, an Island hut bar and snack bar, 7 days 24 hour security in a fully gated complex only a few minutes from Schlitterbahn Waterpark. 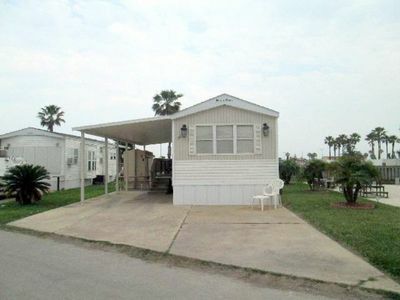 We have recently updated your 1,400+ square foot 2 bedroom 2 bath (1 with a tub) suite that sleeps up to 9 very comfortably. 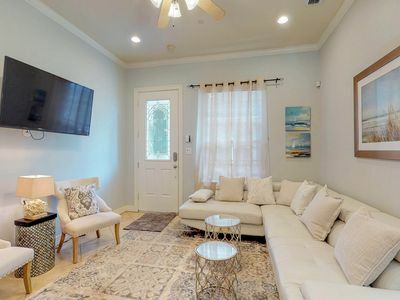 As you walk through your doorway, you will notice that our 3rd floor condo has been recently remodeled and how Bright, Airy and Beautiful your home away from home is appointed. The furniture and accessories have all been updated to provide you with beauty and comfort. The newly remodeled Kitchen is very well equipped. Granite Countertops surround you with solid wood custom made cabinets that enclose every accessory you need for your dining experience. All new appliances have been provided and a Granite dry bar with barware complete your kitchen. 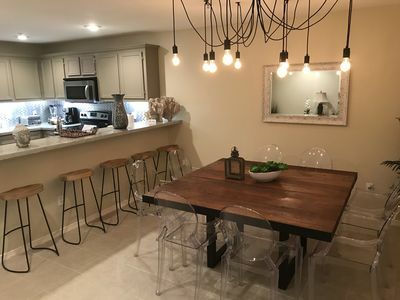 The Dining room seats eight with twoe barstools close by so no one feels left out. 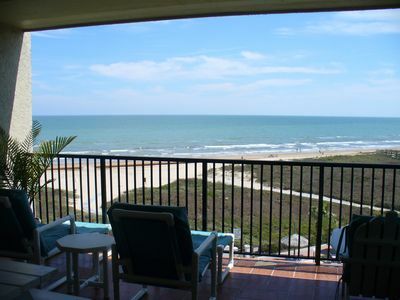 The large Living room is well appointed and updated with wonderful Gulf views. It has a queen size sleeper sofa that sleeps two. 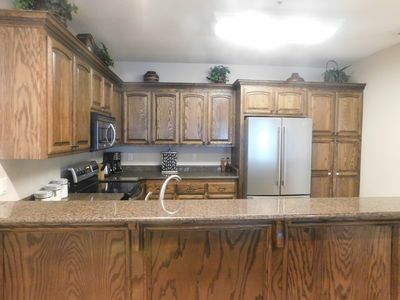 A surprise beautiful wood cabinet, when opened, sleeps one adult very comfortably.large flat screen TV and DVD have been added for your enjoyment. Need to work? A desk with a separate work area is provided with local phone service, WIFI and high speed internet. 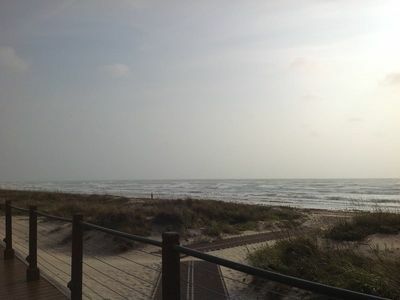 Enter your fabulous Master suite and you have a total wall of windows to enjoy the magnificent view of the Gulf. 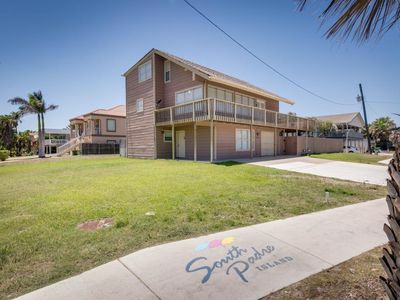 Large and airy, with a King-size bed, remote control fan, clock and cable TV. The closet doors are mirrored and you have plenty of space for all your belongings. The His and Her vanity is filled with plenty of cabinets for storage. The new beautifully tiled shower has a corner seat for you to enjoy the over-size shower head to refresh you. 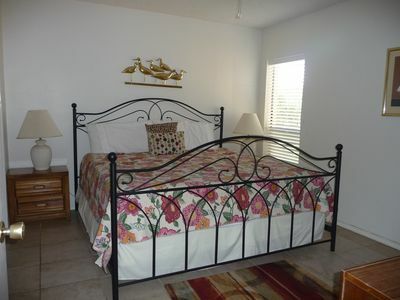 The second very large Bedroom has two quuen size beds that are colorfully appointed. 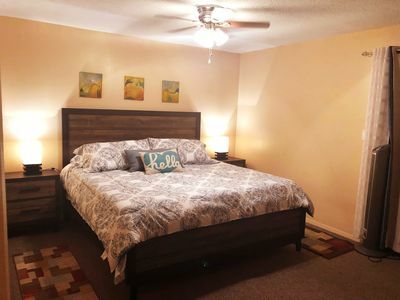 Plenty of room in this bedroom with its cable TV and remote ceiling fan. The second bath has a tub/shower combo, plenty of storage space and a washer and a dryer. 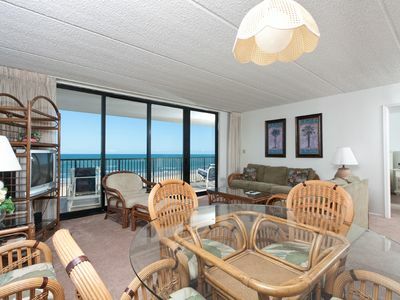 Walk on to the Balcony that fronts the entire Condo. 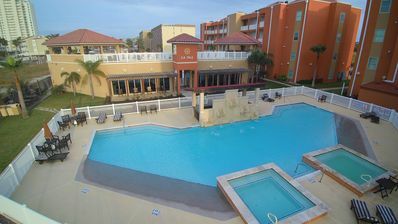 You can see all the Pools, Hot Tubs, Tennis courts and the Gulf from the Balcony. Extra added benefit, a trash shute is close by for your convenience. Relax and enjoy peace of mind, as the Island breezes and the gentle sound of the waves lull your body, mind and spirit into a peaceful state of relaxation. Welcome to Paradise. 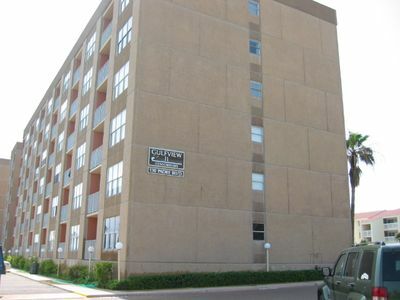 This property is registered with the City of South Padre Island with permit # 2015-093720. 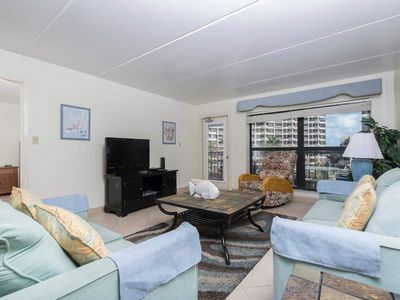 Beachfront condo with great view as seen on HGTV's Beachfront Bargain Hunt! 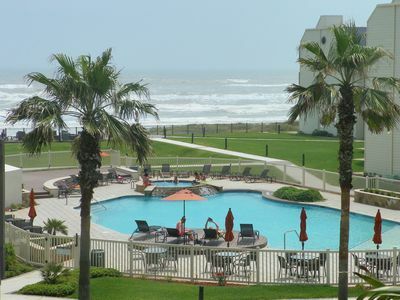 Updated Saida I-601 Beachfront Best OceanView in Padre! Washer/Dryer in condo! 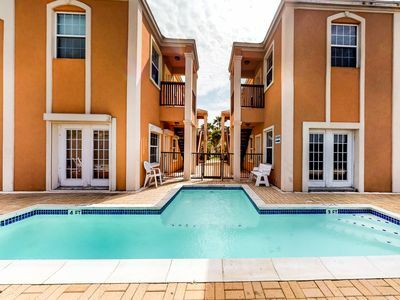 4 Individual Condos, one Rental! 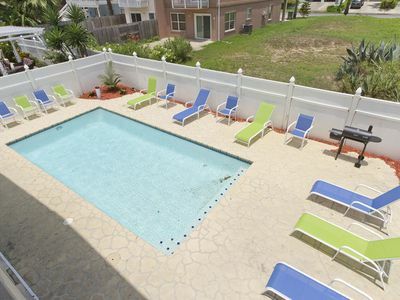 Sleeps 20 with POOL! 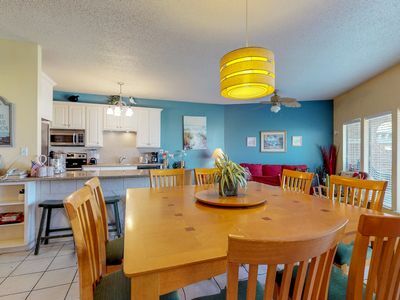 Perfect for Large Family/Friend Retreats! 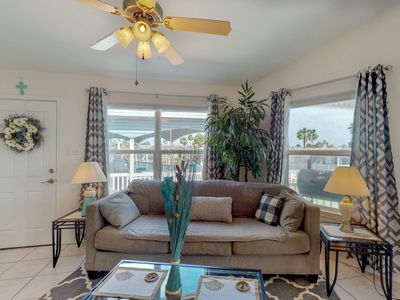 Comfortable beachside condo w/ shared pool - walk to the sand and water! 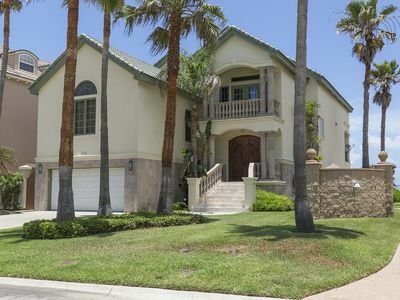 Unique Ocean Front House with Large Private Pool & Hot Tub Overlooking Gulf of Mexico! NEW LISTING! 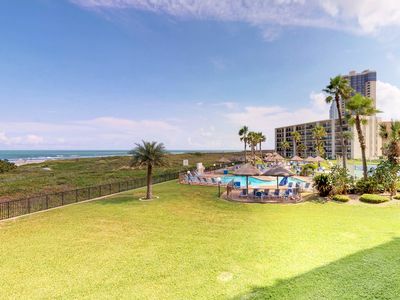 Gulf-front condo w/ shared pool/hot tub/gym & direct beach access!